Overhead Crane Company in Albany NY : Zinter Handling Inc. The 2000 building addition brings almost 20,000 square feet under one roof, at Zinter Handling's manufacturing facility in Saratoga Springs, New York. 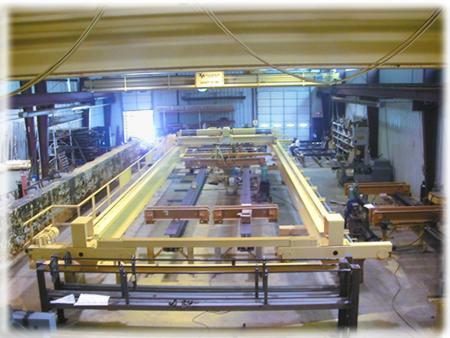 Zinter designs and manufactures single girder cranes, double girder cranes, under running cranes, top running cranes, patented track cranes, gantry cranes, jib cranes, wall traveling jib cranes, stacker cranes, and clean room cranes. Most cranes incorporate a wire rope hoist or a chain hoist. While most of our cranes are installed in New York, Vermont, Massachusetts, Connecticut, New Jersey, and Pennsylvania; Zinter Handling Inc. has overhead cranes in service in nearly all fifty states. Our cranes are supported by 24 hour service and parts. Zinter Handling Inc. is New York State's #1 crane builder!